Blackjack is the world’s most popular game(well, if you asked any casino owner anyway) and to be fair there are millions of players taking to the tables every year to play this simple yet action packed game. However if you’re one of the many who find yourself struggling for time to make it down to the casino often enough to get your fix of Blackjack in then we’ve got a fantastic solution for you: live Blackjack! Live Blackjack isn’t just a solution to your gaming needs it’s also an improvement on what you had before as now you’ll be able to get virtually the exact same experience that an actual live casino can give you except you’ll be able to get it whenever and wherever you choose to! It’s the improvements in live streaming services that have made this all possible and the pictures you get are so seamless and high quality you’ll probably forget you’re sat at home after just a few minutes. And if one of your concerns is you’ll be struggling to see your cards well not only are there full HD graphics, but the game’s also played with a giant deck of cards too so that everyone, even mobile players, can see all cards clearly at all times. If this sounds just like what you were looking for then great, let us tell you how to get in on this action. You’ll want to start by registering an account with an online or mobile casino. Which one doesn’t matter too much as they all offer live Blackjack and its many variations however we’d recommend you start up with a site offering a no deposit bonus just so you get a few games on the house first to gather your bearings. Once you’ve done this you’ll want to head on over to the live casino lobby which requires no more than you clicking the “live casino” tab on the homepage. This is where you’ll find live Blackjack and its many forms and by clicking the table that seems most appealing to you the livestream of that game will begin. 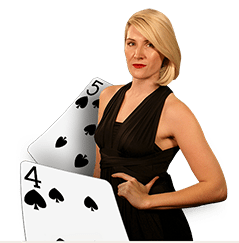 The live stream itself only shows the dealer, the betting table, and the giant deck of cards you’ll be playing with and the chips that you’ll actually use to bet with are virtual and dotted around the edge of the screen. To make a bet you’ll want to click on one of the chips you wish to bet with and then click again on the betting table in whichever betting box it is you wish to place it. You’ll then notice these virtual chips will be moved over to the table and your bet is placed. If you’re not happy with the bet you can always cancel it with the cancel bet button before the dealer starts dealing. When the action starts to get played out when it gets to you all your available options will appear on the screen and by pressing the action you like the most will make the dealer do that for you. Then when the hand ends all winners will be paid out and the board reset ready for a new game. If you’re looking for a way to play more Blackjack than ever before while still keeping the quality of the games as high as can be well now you’ve found your solution with live Blackjack! And the fact that it’s so easy to play is just the icing on top!